...TWO GREAT BRAND NEW DVDs! NIGEL BOOCOCK and RAY WILSON are among the all-time greats of British speedway, both multi-capped internationals and World Finalists who rode with distinction, courage and pride for their clubs and country. 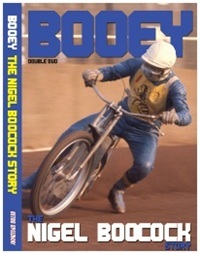 Now these two former giants of the track, 'Booey' and 'World Cup Willy', are the subject of two brand new double-disc DVDs from Retro Speedway, the renowned publishers of Classic Speedway and Backtrack magazines. The former Coventry kingpin is interviewed at his home near Brisbane by Australian Steve Magro, who gets the straight-talking Booey reminiscing about his early days with Bradford, Birmingham and Ipswich before he became a big star with Coventry in the 60s. One of the most humble of superstars, Nigel recalls his battles to overcome serious injuries, including a fractured skull at Leicester in 1969, and the pride he felt in leading his country in Test matches at home and abroad, as well as those British Lions tours Down Under which he did much to organise. We see colour action footage of Nigel in a wheel-to-wheel scrap with his younger brother, Eric, and there are nostalgic clips from his testimonial meeting at Brandon in 1975 and those Lions tours of Australia. There is a video interview with Nigel's late and much lamented son, Darren, filmed in 1997, plus audio interviews that Wally Loak conducted with long-time Coventry supremo Charles Ochiltree and Nigel's former mechanic, Roy Adams. Booey's wife, Cynthia, also talks for the camera. The three-hours production on the Leicester and England legend features a new one-to-one interview with Willy at his Coalville home, where he recalls his greatest triumphs and a glittering career spanning 17 seasons with Long Eaton, Leicester and Birmingham. He talks of his "harem-scarem" days with the Archers at Station Road and what it was like having Ove Fundin as a team-mate. Ray tells of riding for his father, Ron, the team boss at both Long Eaton and Leicester, and responds to those who claim he may have enjoyed favouritism. Sit and back and re-live the on-track brilliance of Ray as he talks us through probably his greatest race win ever - the 1975 British Final epic against Martin Ashby to clinch a World Final berth. We also talk to Ray's wife, Jane, and join him on a recent visit to the new Leicester Speedway track under construction at Beaumont Park, where the new Lions' boss describes his childhood dreams of 'being Ray Wilson'. 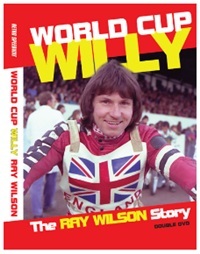 These DVDs will not only appeal to supporters of Coventry and Leicester, but speedway fans in general who appreciate just how good Nigel Boocock and Ray Wilson were as two true greats of their era. By Post from: Retro Speedway (DVD), 9 Nursery Close, Glossop, SK13 8PQ (cheque payable to Retro Speedway). By phoning the Retro Speedway Credit/Debit Card Hotline on 01708 734 502.